In its third edition, here you are the new hiking map of Mount Amiata. 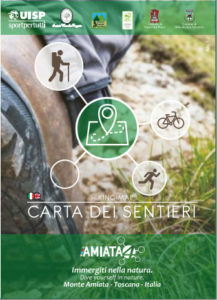 Created in collaboration between Booking-Amiata, Hotels and the municipalities of Mount Amiata, the map includes all the main mountain trails, circular and not. It is very intuitive and user friendly; for each track you can find altimetries, detalied technical info and a description that has the aim to help the hiking lovers to choose the trail which is most suitable with their skills and expectations. For fans of technology, a QR-Code will soon refer to the relative GPS track. So…what are you waiting for? Come and find us on Mount Amiata; we will welcome you at the best!